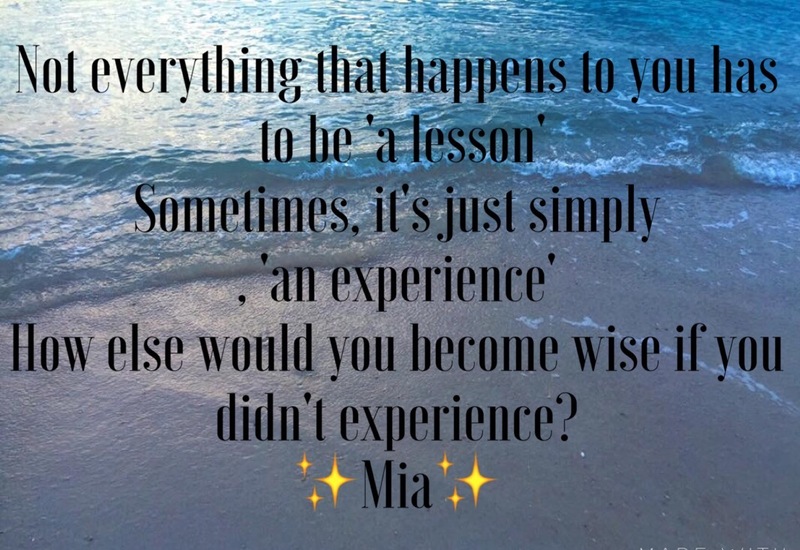 Is everything bad that happens to us ‘a lesson’? Hello lovelies. Good of morning from beautiful Thailand! It’s philosophical Sunday ☺️ always a good day to be still & reflect.. So let’s talk about relationships for example. & I’m not talking about a long term relationship, or marriage, I’m talking g about fleeting moments that we always put down to ‘a lesson’..
Having experiences with new relationships that haven’t worked out as you hoped, or it started nice but was brief, they never called you, or whatever else your expectations were of that meeting of souls..
There’s a word ‘expectation’ … We all know where expectation leads, right!? Often we think, or assume, that when we meet someone new, it’s a ‘physical attraction’ or a ‘chemical attraction’ , a ‘soul’ attraction etc, something that passed or an energy shared between you that ignited something in you & made you curious to know more about that person. So you had/have some kind of expectation. Right? The mind starts forward planning…. We can’t help it.. It’s rare to be ‘present’ with these feelings. Maybe it wasn’t a lesson at all. Maybe it was part of your healing process. Your evolution. The universe actually pushed the person towards you. Because sometimes, that person is a actually mirror, a reflection. Not a lesson. Not here to teach you, but to SHOW you. And that doesn’t mean it has to be something bad, something dark, something negative, within you! You liked the persons’ innocence, purity, wisdom, beauty, charisma, energy, loving, caring nature, their thoughtfulness, their warmth, the love in their eyes when they looked at you..
That’s why you were drawn to them. So how about looking at it from another, more positive perspective. The universe pushed that person towards you because it wanted to SHOW you, it wanted you to recognise & see this amazing part of you that exists within yourself. The ‘thing’ you have forgotten, because you focus more on looking for it in another, instead of within. You liked that younger person…. why? ……because your soul recognised something that was once part of you, youthful beauty, innocence, purity, before you became a little older & more wise. Maybe sceptical or doubting, not trusting. So It wanted to show by mirroring to you your own inner beauty, before you reached the point in life where you constantly criticise yourself for being older, fatter, etc etc…, right? because let’s face it, most of us do not want to get old & wrinkly, do we!? Me included! (But it is a price often denied to many! So have gratitude for that at least). You were attracted to that older person because your soul recognise that wisdom, care, thought, gentleness, love, within you. It is showing you, that ALL THIS is within you! So why not just accept what happened as ‘an experience’ & stop trying to figure out what is ‘the lesson’ driving yourself crazy in the process. It’s part of your growth, evolution, to wisdom. It is why we are all here on this planet. So that we can pass on this wisdom & knowledge to others & help them to grow too. So accept the experience. Release the expectations. That’s just the ego. Experience is knowledge. Without knowledge there is no wisdom. What did that ‘experience’ SHOW you about yourself? What did you recognise WITHIN that person when you first met, those first moments, before it went wrong, or they moved on, or didn’t call you.. ? Beauty? Innocence? Wisdom? Kindness? Love? Look for the goodness within YOU! Get in touch if you need guidance.